Diamond’s natural beauty allows her to become our model for the day, although this is her first modelling experience. Our city photoshoot in Phnom Penh. 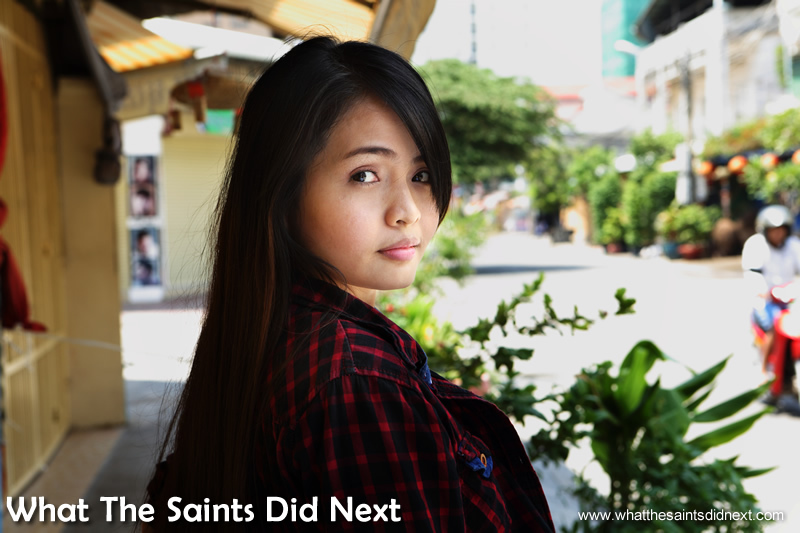 Shooting models in cities around the world is becoming a passion and we had the pleasure of doing a photoshoot in Phnom Penh with a local girl we got friendly with during our stay in Cambodia. Have you ever woken through the night having dreamt about work? Admittedly not all of us would be so conscientious and don’t care one iota for our jobs after 5pm. Diamond. Our city photoshoot in Phnom Penh. Diamond as she is known (easier for guests to remember), works at the Frangipani Living Arts & Spa Hotel in Phnom Penh, Cambodia and for us she is the ‘face’ of the city. That’s because we think hotel staff are the frontline of any country or place and are usually good indicators of its people. Diamond is one of them; hard-working, friendly and modest. She’s also soft spoken which matches her angelic face. We’re sat by the hotel pool, surrounded by the sweet fragrance of white frangipani trees. Taking time out of her busy work day, Diamond tells me all about life in Phnom Penh. “I really love my job,” she tells us. “I get to meet people from all around the world; Australia, America, Korea, China, like you from St Helena and I’ve improved my English speaking a lot. For a first time model, Diamond was a little shy to begin with, but very easy to photograph. Our city photoshoot in Phnom Penh. Like many working in the Frangipani hotels, Diamond is very appreciative of place in the team. “I love my boss, the CEO,” she says, telling us he trains all the hotel personnel. He is well-known Cambodian entrepreneur Din Somethearith (Ritz), an advocate for education who has an inspiring ‘rags to riches’ story. “We have three hotel owners,” she says. “The CEO, he’s travelled all around the world and worked for the UN. Between them they’ve studied architecture, finance and tourism. They then combined their ideas to make hotels, so we now have eight. 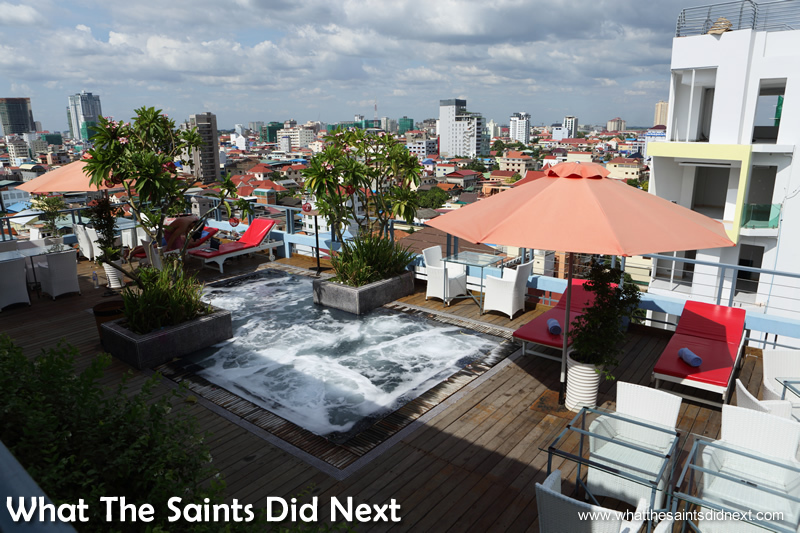 The Frangipani has a roof top mini-pool and bar with great views over the city. Diamond’s hometown is the Pursat province, a five hour bus ride west. Having to travel away from home for work is a story familiar to many all over the world. Our city photoshoot in Phnom Penh. Pursat is also home to Wat Bakan, an 800 year old temple and one of the oldest active pagodas in Cambodia. It is revered as one of the most holy sites of Cambodian Buddhism. It was also the setting where she met her boyfriend five years ago. They ‘clicked’ and formed a relationship with the blessing of their families. He also now lives in Phnom Penh and is currently studying law. “We’re going to get married in two years time,” her face flushes when she says this. 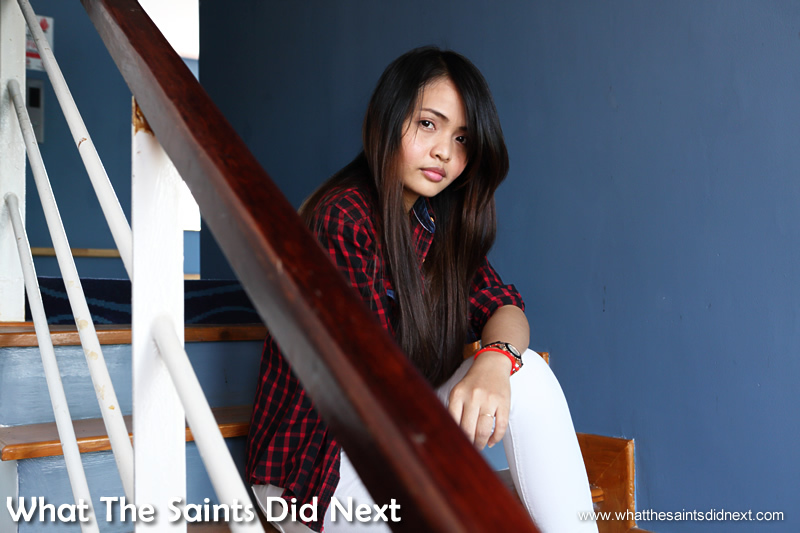 Diamond taking her new found model confidence onto the Phnom Penh street. Our city photoshoot in Phnom Penh. Diamond arrived in the big city five years ago to study Accounting and lives with an older brother. “I used to work as an assistant accountant but I really didn’t like it,” she laughs shaking her head saying she “wasted” three years gaining a bachelor’s degree in a subject she doesn’t like. “But now finally I have a place I enjoy and am happy. I will work here forever. Let’s say the hotel is my life. Maybe I’ll work here until I die!” Now that is some serious job satisfaction. 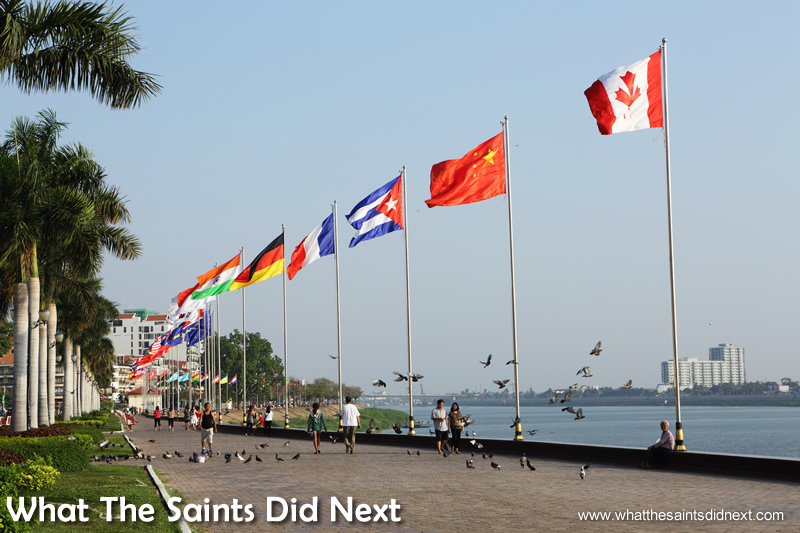 The international flags of the Riverside promenade, a popular place for locals and tourists to hang out. Diamond in work mode; very professional. Our city photoshoot in Phnom Penh. 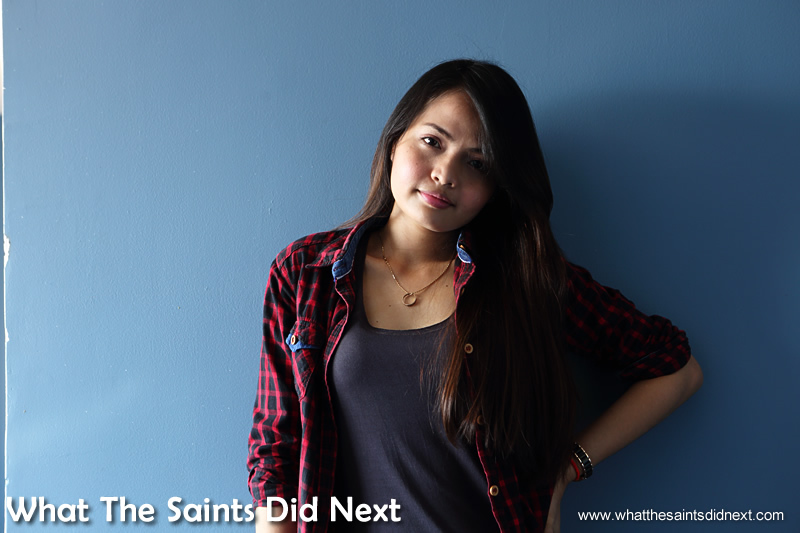 What would she like to see changed about Phnom Penh? “I would want the government to fix the roads. They are very bad and we have a lot of traffic jams. Also the rubbish on the street, it does not look good to the foreigners.” Darrin and I also think litter is a problem in the city. Hmm, we wonder if it’s going to be on her wedding menu. End of our photoshoot in Phnom Penh with Diamond. For more of our photo stories from Cambodia, click here.